These carefully designed, etched and hand coloured cards depict full-length figures of English historic personages. The King of Hearts is Sir Rhys Thomas (a controversial character in Welsh history), the Queen the Comtesse de Salisbury, the Valet, who carries a helmet in his hand, is unnamed, but the word 'France' is engraved at the left-hand lower corner. The King of Clubs represents Buckingham, the Queen the Comtesse de Marlborough, the Valet, who bears glasses on a salver, is unnamed. The King of Diamonds is Mac-Farlan, the Queen the Comtesse d'Argyle, while the Valet, who bears a falcon on his left hand, is unnamed, but the card has the address, "Gibert Fabr. a Paris," at the background. The King of Spades is Leicester, the Queen the Comtesse d'Oxford, the Valet is unnamed. The suit signs on the Kings have a crown above them, and those on the Aces are contained within arabesque ornaments. 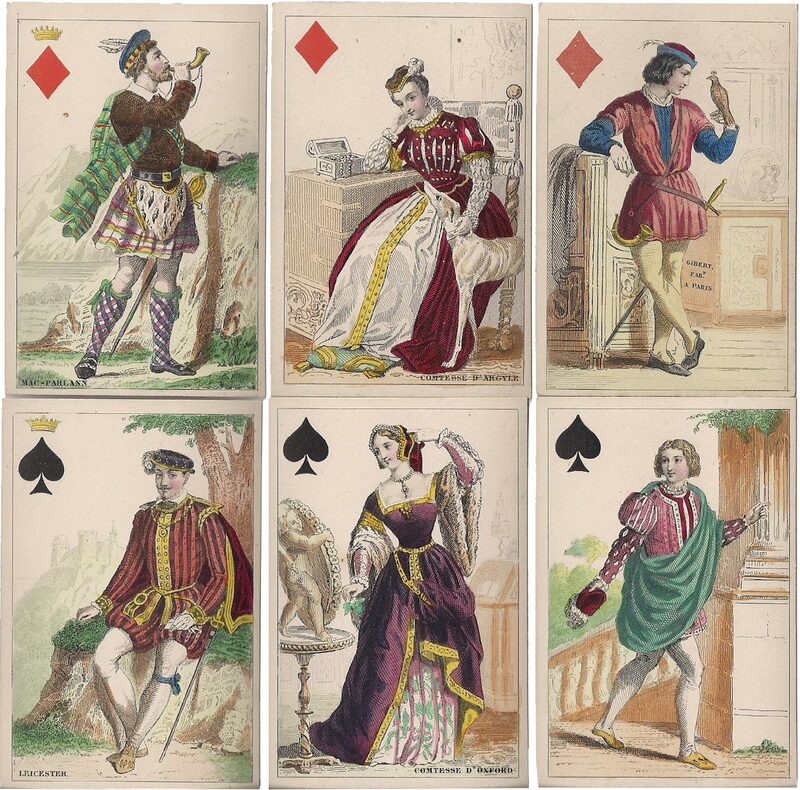 Above: cards from a hand-coloured costume set by O. Gibert, Paris, c.1856. Square corners, plain coloured backs, 84x55 mms. 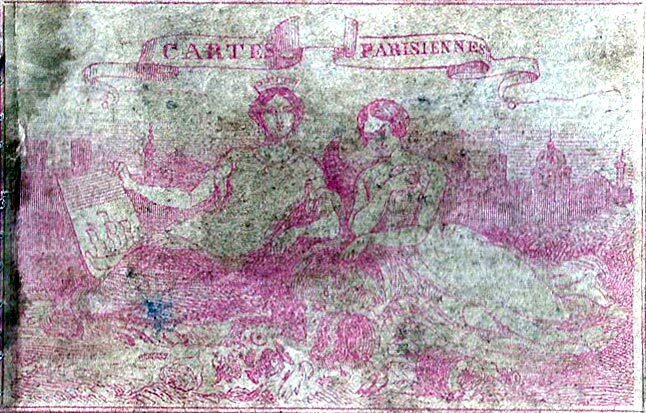 An engraved and ornamental wrapper accompanied the set. It represents allegorical female figures emptying from a cornucopia all kinds of fashions in the way of bonnets, muffs, shoes, &c., and bears the inscription: "Cartes Parisiennes, Paris Rue des Singes. No. 3." Images courtesy Rod Starling. The suit symbol on a given character is not always the same as in other examples of the same deck. 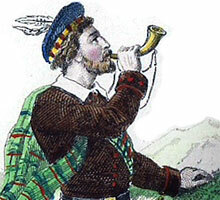 That is because, being hand coloured, there was no consistency from deck to deck. There also seems to be some confusion regarding the titles of these similar French costume decks. 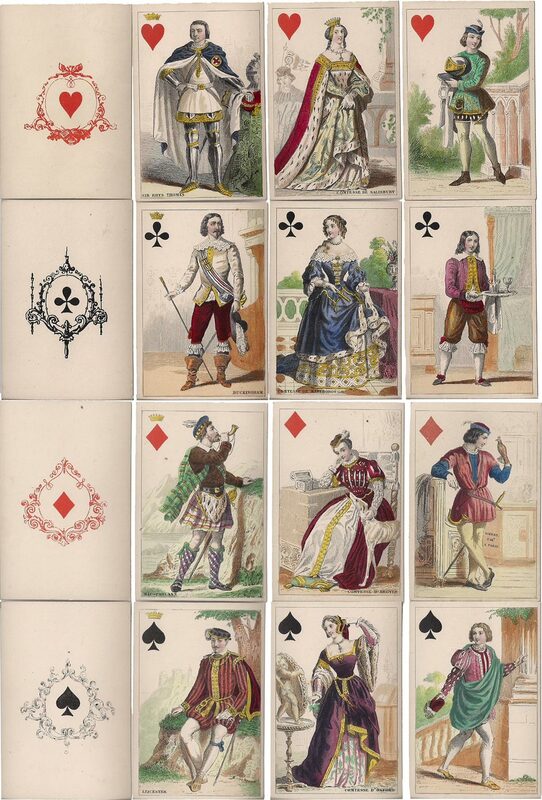 In particular, this "Cartes Parisiennes" deck is also known as "Jeu de Costumes Historiques Anglais". Willshire, William Hughes, "A descriptive catalogue of playing and other cards in the British Museum, accompanied by a concise general history of the subject and remarks on cards of divination and of a politico-historical character," Trustees of the British Museum, London, 1876. Cards from the collection of Rod Starling.